I was introduced to mind maps at school as a way to take notes during class but never really worked with them. Earlier in the year, while studying for my DCD I happened to see somebody at the library referring to a mind map while they were working. That got me thinking; mind maps are quite personal as in you put it together. In effect, its your mind map, its put together in a way that you can reference information clearly as it relates to how you have stored it in your mind. I was going through Jason Grierson excellent DCD 5.5 Study pack at the time and decided to create a series of mind maps from the info. This allowed me to very quickly go and look for the detail I needed. If you are studying towards your DCD the DCD 5.5 Study pack is a really good collection of information that you should download and go through. Lets take a look at the map I created for the three different types of designs that VMware references. This is quite a small map but allowed me to quickly get the differences between Conceptual, Physical, and Logical designs. 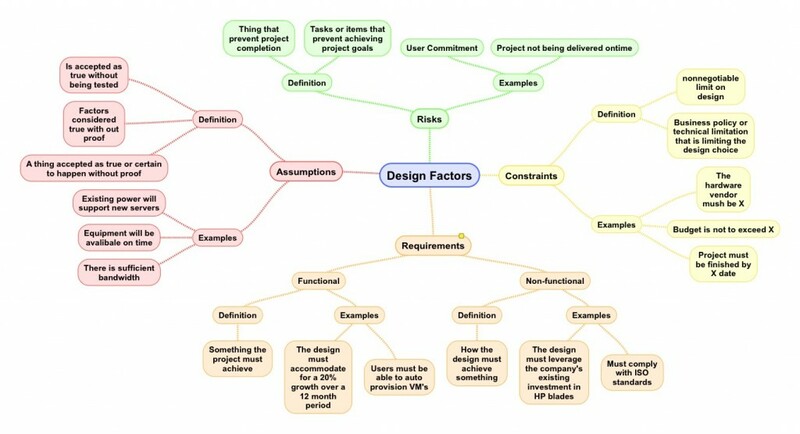 The next map looking at the four design factors has a bit more detail giving examples and definitions of risks, assumptions, constraints and, requirements. And as a better example this map dives into the design requirements of manageability, recoverability, availability , security, and performance. 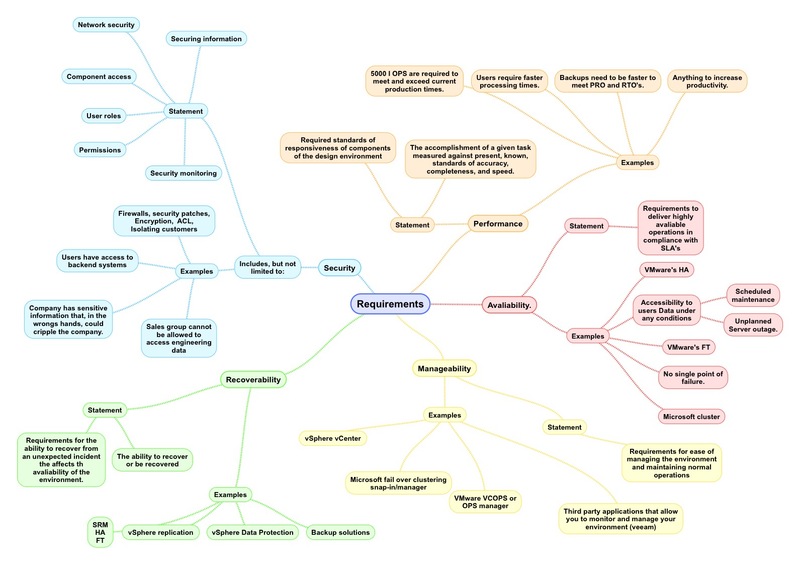 Still not a big mind map by any means (the ones I’ve been working on for my VCDX are getting a bit on the big side). Many of the maps I create will only ever be seen by me. I use them as references when working on designs. Actually I’ve been using them for any projects I now have, both professional and personal. I’m looking at doing some work on my kitchen and this tool has helped keep all my ideas together in a way that I can easily reference them. The reason I chose to show these maps is to give you another tool when putting together designs and working out what the client/your boss is trying to get you to do. The software I use to create my maps is Simplemind. It’s avaliable for PC, MAC, Android, and IOS. There is less featured free version for IOS and Android. The map can be shared through all platforms via Dropbox.